As you are aware that the Central Government Employees issues particularly review of New Pension Scheme, Minimum Wage and Fitment Formula are pending since long. Its unfortunate that inspite of assurance given by Cabinet Ministers and our pursuration with you time to time has not yilded any result so far. We had defffered the strike on a clear cut assurance but the committees formulated to resolve the issues have not done any thing, with the result creating lot of anguish amoagest Central Government Employees. 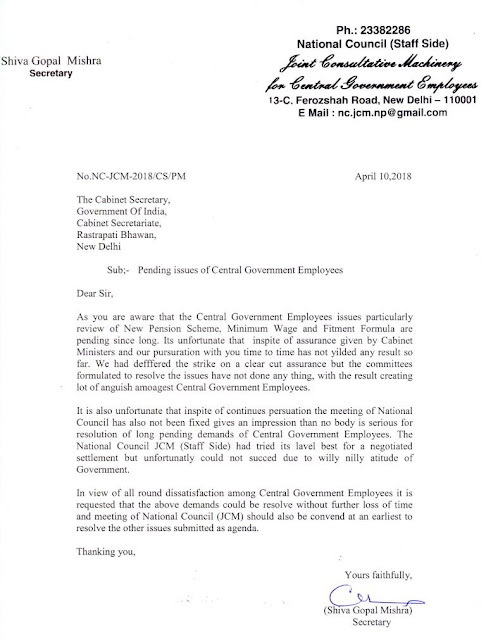 It is also unfortunate that inspite of continues persuation the meeting of National Council has also not been fixed gives an impression than no body is serious for resolution of long pending demands of Central Government Employees. The National Council JCM (Staff Side) had tried its lavel best for a negotiated settlement but unfortunatly could not succed due to willy nilly atitude of Government.